"I’m a junior in the midst of getting my major in music and probably a minor in Political Science." How long have you been singing in choirs? "The first choir I was in was my church choir in first grade and I’ve been lucky enough to be able to sing in choirs ever since!" What's your favorite musical memory? "When I was a junior in high school my madrigal choir was asked to sing the Michigan State University Alma Mater at the funeral of an elderly man who lived in our small town. None of us knew him--his daughter had simply reached out to my director because her father loved playing music and singing so she wanted to create a service that was able to commemorate that. Of course it was a sad occasion but there was such a presence of joy in coming together to hear various family members play the instruments he had taught them and to sing together. The whole experience served as such a strong reminder to me of how powerful music can be and just how quickly it can create a strong community that is supportive and kind and there for each other in times of grief as well as joy." Do you have any special talents or interests outside of music? "I love going hiking and exploring the outdoors, reading, and hanging out with my dog." "I feel like I can’t pick just one but lately I’ve been really into reading about and listening to the music of Pavel Chesnokov, an early 20th Century Russian choral composer." Who's your favorite non-classical musical artist? "At present it’s definitely Janelle Monae." What song have you not been able to stop listening to? "The Night We Met by Lord Huron." What's your favorite book you've read? "You can’t ask me what my favorite book I’ve ever read is, that’s just cruel. However, the book I’ve read most recently is a collection of poetry by the wonderful American poet Sara Teasdale." If you could turn anything purple, what would it be? "I mean I feel like after they finally won a superbowl after what seems like a thousand years, I have to say the Philadelphia Eagles." What's the most interesting fact about you? ​"For my eighteenth birthday I participated in a polar plunge on the coldest day of the year. The wind chill made it feel like zero degrees so that was pretty cool." Hannah Kolarik just finished her first season with Lux. She is a junior Music major at the Sunderman Conservatory at Gettysburg College and has been singing in choirs since she was six years old. 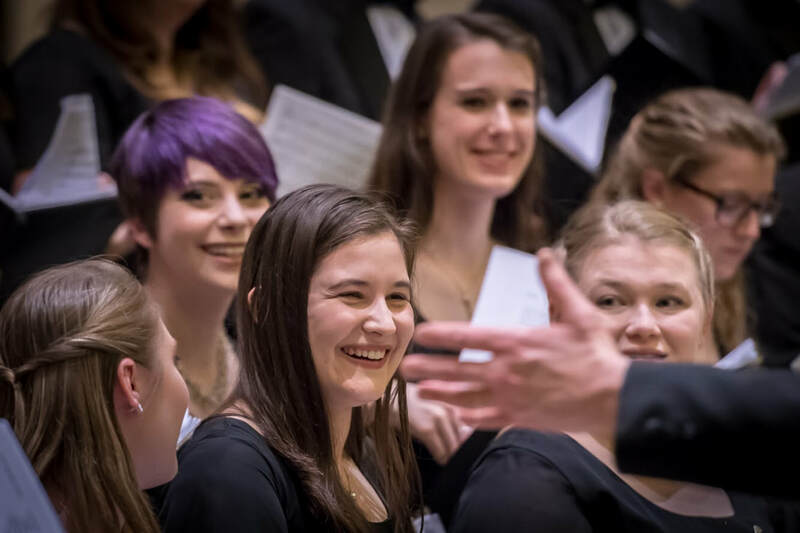 On campus, Hannah sings with the Gettysburg College Choir, Opera Workshop, studies voice with Professor Jeffrey Fahnestock, and works in the Office of Choral Studies with Dr. Rob Natter. Though originally from New Jersey, Hannah is spending part of her summer working at the Cathedral Choral Society in Washington D.C. as an Administrative Intern. She is so excited to be singing with Lux this summer and spend time working with and performing the music that she loves so much.